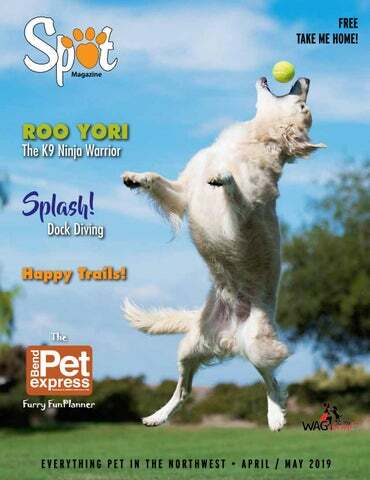 Spot serves to educate, entertain, connect and support pet parents, professionals and organizations committed to the health, happiness, safety and welfare of animals. Spot Magazine welcomes opinions and letters to the Editor. To be considered for publication, letters should be signed and include the writer’s full name, address, and daytime telephone (for internal use only). Spot reserves the right to edit letters for length and clarity. Mail to: Spot Magazine, 527 NW Elm Ave, Ste 3, PMB 221, Redmond, OR 97756; Email to: Publisher@SpotMagazine.net. Opinions and ideas expressed by writers and/or advertisers herein are not necessarily endorsed by, nor do they necessarily reflect, the opinions of Spot Magazine or Living Out Loud, Inc.
he silence of snow in the air has turned to the lyrical sound of songbirds and Spring Fever has a firm grip on you! Your pets feel it too: the anticipation of jingling leashes and that door opening to the big green world full of fresh smells to explore. The cats lying in that toasty patch of sun near the window oversee the goings-on of foraging squirrels and playful birds. And to celebrate the seeds of change, Spot is exploring ways you and the furkids can have fun together and help each other stay fit and safe. Or — in the case of this Publisher and her “fluffy” fur-friend Feather — to work together to GET FIT. Spot recently took a field trip to learn more about the sport of dock diving and came away with so much more. Witnessing the camaraderie and energy of a room full of spectators cheering each and every four-legged athlete to fly across the pool as far as they could, is smile-inducing even for the biggest curmudgeon among us! Littles with their stumpy legs muster every ounce of forward motion to fly as far as they can to capture their prize. With just the right amount of encouragement and drive, a larger guy nearly makes the other edge of the pool!! Dare to photograph from pool side and you’ll need quick reflexes for the splash! And so, this particular round of the dock diving sport is aptly named “Splash!” Much as the sport of dock diving engages both human and dog toward a mutually satisfying goal, Roo Yori — the K9 Ninja of American Ninja Warrior — told Spot his favorite times are spent bonding with his dogs in competitive down-time. It is also clear from his social media feeds he adores playful times with his adoptees, like practicing CrossFit Progression Crawling on the kitchen floor, each of them engaged in the simple joy of the moment. Roo advocates for animal welfare, proudly sporting an ADOPT A DOG shirt at every competition and holding the Ninja for Dogs fundraiser — a pledge-per-obstacle fundraiser he runs during his ANW Season competitions. Roo has a special affinity for socalled bully breeds; he launched the Wallace the Pit Bull Foundation in honor of a shelter dog turned world Frisbee star with an unwavering spirit. Spot hopes this Spring finds you lacing up those walking shoes, hitting the trails with your furry bestie and enjoying some coveted bonding time. In the following pages, you’ll find plenty of information and inspiration to help you stay active and have fun out there! Published bi-monthly. Distributed in Portland Metro, Willamette Valley, Central Oregon and surrounding areas. All rights reserved. Reproduction in whole or in part prohibited without the express permission of Living Out Loud, Inc.
A Hillsboro business is jumping into one of the world’s fastestgrowing dog sports. Spot introduces you to the people and dogs of dock diving. 10 Spring Pet Safety Tips: Mushroom Toxicity How to keep pets safe around this ubiquitous part of outdoor life in the NW. 11 Physical Therapy 4-1-1 If you have a pet who’s recovering from an injury or surgery — or one who lives with special needs to age-related challenges — an expert shares what you need to know to get the best rehab and physical therapy to keep them healthy and active. 14 Roo Yori: The K9 Ninja Warrior This passionate dog rescuer uses his national spotlight to encourage dog adoptions. He talks to Spot about training, quality time, and life in a house full of rescue and foster dogs. 18	Happy Trails Dog parents and park experts share the Northwest’s best places for you and your pup to hit the trail this season. one of the fastest-growing canine sports in the world, dock diving is making a big splash with dogs and humans alike. Enthusiasts in the Northwest are fortunate that Hillsboro is home to an indoor dock diving facility. In dock-diving events, dogs run the length of a dock and leap as far as possible into the water, competing for distance, height, or — in timed events — for speed. Human competitors throw a prized toy just out of reach, motivating dogs to keep their momentum and launch into the pool at the best-possible angle. The sport offers variations on the diving theme. For example, an inthe-air retrieve event, the coveted dog toy is suspended four feet above the water to start, moving higher as dogs complete each level. With its growing popularity, the sport is drawing a wider variety of breeds. “About 10 years ago, it was pretty much all Labs, but then the other breeds started to try it. Right now Whippets kind of rule the sport,” Kunkle explained. Getting Their Paws Wet Dogs benefit from the equalizing effect of water, making the sport accessible to all sizes and ages. “All they need is a strong toy drive and a love for swimming,” Kunkle enthused. “We have two labs who still compete at age 14.” Kunkle says new dogs get a slow introduction to the sport. “We start them off the side deck, only 8 inches off the water, before moving them to the dock,” she explained. follow his example. Hoodlum’s success drew Zimmerly-Offinga’s friend from Canada, Mary Young, into dock diving. She has elite jumpers and announces at events. Young’s dog, Swindle — a female Belgian Malinois — is an elite jumper who jumps far and high. Swindle is “the best counter surfer around, and likes to sleep under the blankets at night curled in between her humans. She loves everything she does and gives 100% every time,” Young says. Motive and Swindle went to Nationals last year, where almost 800 dogs competed. “I think there were about 20 dogs from the Pacific Northwest,” Zimmerly-Offinga enthused. The Pacific Northwest offers other diving event locales, including a mobile dock, but the indoor venue is a favorite of some dogs who — like Motive — hate cold water. “We call her Sensitive Sally because she doesn’t like to jump into cold water. She likes to jump at PAWS, because the water is warm.” Zimmerly-Offinga is also training Frantic, a puppy Young gifted her. “Frantic is a Boston Terrier/Whippet/Staffy mix, all legs. He’s very cute, After I lost Hoodlum to GI lymphoma, I said I didn’t need another dog. At diving events, Mary kept saying I did, since Motive doesn’t like cold water. She ended up making a four-hour drive for a puppy I said I didn’t want, and she brought Frantic back.” That’s what friends are for. Interested in seeing if your pup has a future in the sport? Kunkle offers introductions and assessments at PAWS. A first-time assessment is $65. After that, dock diving lessons are $45. And on Saturdays from 2-5 there is open dock diving practice, at $25 per dog, no appointment required. 503-640-4007 • www.pawsrehab.net Diving events require registering with NADD — North American Diving Dogs — $35 for the life of the dog. Each competition has entry fees. For information on registering your dog with NADD and finding an event, go to NorthAmericaDivingDogs.com. Christy Doherty writes from her heart in a house a few deer trails off the beaten path. Her work takes place under the wise scrutiny of miraculous 17-yr-old Octavia, her soul kitty, a RagaMuffin cat with hypertrophic cardiomyopathy. Christy has received national awards in journalism, and most recently, two Maxwell Awards from the Dog Writers Association of America, for a total of six Maxwells. lacing up your shoes and walking your pup around the block is kindergarten, Kyra’s Canine Conditioning is graduate school, but with easy directions. This is the ultimate how-to book that breaks up complex exercises and cool dog tricks into clearly-illustrated steps. From the opening chapter, which introduces the reader to canine anatomy and safe ways to stretch your dog’s muscles, to the final chapter, where readers learn to teach their dog complex exercises like handstands, the book builds on foundational information and adds complexity as human and dog are ready. As a bonus for Northwest pups and people, all the exercises can be done indoors, making this book a welcome rainyday or cold-weather companion. With tips on training wiggly young puppies to slower senior dogs, Kyra’s Canine Conditioning offers show-stopping exercises to engage you and your dog with just enough physical and mental challenge to keep you both in top shape. ushrooms play an essential role in the decomposition of organic matter. They are fundamental in nutrient cycling and exchange within ecosystems. Unfortunately, though, many of the mushrooms in Oregon are toxic to pets. In late spring and early summer, Sunriver Veterinary Clinic in Central Oregon treats many patients for mushroom toxicity. These animals may present with profuse drooling, vomiting, diarrhea, tremors, or they may be in a coma. Apart from such obvious symptoms, bear in mind that toxic mushrooms can also injure your pet’s liver. Treatment involves the induction of vomiting (if the animal is conscious) to empty the stomach of remaining mushrooms. Intravenous fluids are then initiated to help flush toxins from the bloodstream. Activated charcoal, given by mouth, binds the toxins within the gastrointestinal tract and the toxins that circulate through the liver and bile. Pets may also need supportive liver medications and supplements. With treatment, the prognosis is good. Please inspect your yard for mushrooms and watch your dogs closely on the trail this time of year. Unless you are a mushroom expert, please assume all mushrooms are toxic to pets! Wear gloves when removing them from your yard and throw them away in a place your pet can’t reach. If your pet ever ingests a mushroom, contact your veterinarian immediately. Dr. Merideth incorporates both traditional and alternative veterinary medicine in the care of pets at her Sunriver Veterinary Clinic in Central Oregon. She especially likes helping older pets feel better through acupuncture. umans commonly get physical therapy for a variety of recovery situations from hospital or clinic post-op to nursing homes and rehabilitation centers. Physical therapy for pets should be no different. After an injury or orthopedic surgery, pets need help to recover and their families need guidance in how soon to return them to full mobility. Elderly pets also benefit from exercises tailored to their specific condition so they can maintain the best mobility and quality of life for as long as possible. Pets and pet parents dealing with paralysis need expert guidance on the path to recovery..
Who does physical therapy? Physical therapy should only be performed by a certified practitioner. The qualifications to look for are CCRP (Certified Canine Rehabilitation Practitioner) or CCRT (Certified Canine Rehabilitation Therapist). What about cats? Kitties are unique and obviously not as easy as dogs, but they too can have physical therapy. So who should have physical therapy? If your pet is in pain, limping, arthritic, or has neurologic issues, he or she most likely can benefit from physical therapy. Ask your veterinarian for a local referral. Physical therapy for pets is relatively new for veterinarians too, so a web search for “physical therapy for pets near me” should help get you on the right track and your pet back on his or her paws. Hydrotherapy: The underwater treadmill helps the dog support his weight on his sore limbs while learning to gait again. For paralyzed dogs, therapists guide their walk in the proper upright position. For elderly dogs, in addition to the buoyancy, the water is warm and helps with blood flow to their old bones and muscles. Therapeutic laser (“Cold laser”): Laser is FDA approved for both animals and humans to help tissues return to their previous strength by increasing blood flow, reducing inflammation, and increasing cellular repair. Therapeutic ultrasound: If you have had PT yourself, you probably have had ultrasound, which generates deep heat to the tissues. Think about how good hot water feels when your back hurts; ultrasound carries that heat deep into the soft tissues. Physiotherapy (exercises): Yes, dogs can do exercises just like people, and this is where the art of canine physical therapy comes in. A good therapist finds the right motivation for even the most stubborn or reluctant dog and tailors exercises to the dog’s abilities too. Locals who were saddened at the sudden closure of Portland’s Purrington’s Cat Café can celebrate the upcoming debut of Purrs and Pastries Cat Café. Coming soon to Tigard, the new hangout will be part pastry shop, part local feline adoption center. Owner Tracy Stocker will team with Felines First Rescue and a local bakery to offer adoptable cats in a cozy café atmosphere with organic and vegan pastries. She’s readying the space with a vertical cat playground and cattery that’s expected to house 10-12 adoptable adult cats that customers can watch from a café table or visit in person for a small fee. Get updates on the opening date and her fundraising campaign at PurrsAndPastriesCatCafe.com. Friends Remember a Beloved Animal Advocate Friends and colleagues packed a Molalla church on March 30 to memorialize Sue Heublein, a leader in the movement to unchain dogs across Oregon and the US. Sue had served on the board of directors for Portland-based Fences For Fido, where she also volunteered as a client outreach coordinator and Photo Credit: Brian Grubb fence builder, working with area families to free dogs from life on a chain. Most recently, she co-founded Unchained Planet, a project of Fences For Fido to mentor groups and individuals across the country in starting their own unchaining organizations. Central Oregon’s first choice for dog boarding and daycare! Give your dog a fun experience they deserve. Your happy dog will thank you for it! The Humane Society of Central Oregon (HSCO) and Bend Spay+Neuter Project now share an umbrella. With allied missions and a history of working together, Bend Spay+Neuter Project (BSNP) is now a program of HSCO, continuing to provide low-cost spay and neuter and basic wellness services for pets. “There has always been a strong relationship between HSCO and BSNP and we worked together on many projects that affect animal welfare in Central Oregon,” said HSCO executive director Sabrina Slusser. “This move makes good sense so we can provide easy access, under one organization, to a wide array of services that provide compassionate and humane care for animals” BSNP will continue offering its low-cost services — including spay and neuter surgeries, vaccines and wellness exams — from its current clinic on Wilson Avenue in Bend. HSCO plans to continue offering programs such as specialty clinics in outlying communities, and is exploring ways to merge the two organizations’ pet food banks. For more information visit HSCO.org. Fences For Fido Celebrates 5 Years in Central Oregon NW-based Fences For Fido turns 10 years old this summer. The volunteer group has unchained 2,000 Oregon and Washington dogs in its first decade, drawing national attention for its shovel-to-the-ground approach to improving dogs’ lives. Meanwhile, the organization’s Central Oregon volunteers are marking their fifth year in action. The Love Story of Red Lady and Goliath It’s a three-tissue sad story with a beautiful ending. The saga follows two wild mustangs from freedom on the expansive rangelands to capture and confinement after a Bureau of Land Management roundup, and eventually to their happily-ever-after in Prineville. Organizers at Central Oregon’s nonprofit Skydog Sanctuary saw a rare opportunity to reunite two deeply Photo Credit: Skydog Sanctuary bonded wild horses after the BLM roundups. It’s normally an impossible feat because of a lack of documentation about the horses’ original home ranges and herds, but reliable photos had clearly identified the handsome black stallion named Goliath and his mate Red Lady, who was pregnant with the pair’s first foal. Hoping to unite Redmond residents, businesses, and volunteers around their shared love of pets, the For the Love of Pets Benefit Festival rolls into its third year this July. It’s a dog-friendly community celebration to benefit local animal shelters, and it offers music, food, local craft brews, and adoptable pets. After being rounded up and removed from her rangelands, Red Lady was adopted by a rescuer in Colorado. When Skydog organizers heard Goliath would be auctioned in Utah, the group started fundraising and raised enough to submit the winning bid on Goliath and reunite his family. After the auction, rescuers transported Goliath — who was now gelded — from Utah to Oregon, where his Red Lady was waiting. Organizers say the event focuses on raising money and awareness for animal welfare organizations while bringing together members of a rapidly growing Central Oregon community. This year’s festival is scheduled for July 20, 2019 from 11 a.m.-6 p.m. at American Legion Park in Redmond, Oregon. Find details at FLPbenefit.com and remember: your pups are invited to join the party. In a scene befitting the silver screen, Goliath galloped through snow-covered pastures the length of three football fields to reach his love. He nosed Red Lady’s belly three times, seeming to sense their growing foal inside, then he touched noses with the mare and the pair trotted into the forest of their new home. Responding to unmet needs in the region’s rural communities, Central Oregon volunteers build one or two fences a week in surrounding communities. The group will mark the Central Oregon milestone with an open house on the afternoon of May 19 at the Environmental Center in downtown Bend. Details are at FencesForFido.org. Stay tuned for more on this reunited family as rescuers await the foal’s birth. Go to SkyDogRanch.org. And have that tissue ready. a young student athlete, Andrew “Roo” Yori had Ninja-level skills both on and off the sports field. Soccer was his favorite high school sport, although he competed in others too. As a college athlete he held the long-jump record at St. Mary’s University of Minnesota and still graduated as the outstanding male senior with a degree in Biology. Whatever he takes on, he puts his full self into the effort. Today, 41-year-old Roo Yori holds an impressively brainy job in the genome sequencing laboratory at Minnesota’s famous Mayo Clinic. But, true to form, he’s matching brains with brawn as a multi-season competitor on TV’s American Ninja Warrior. To the uninitiated, the show looks like an otherworldly display of super-human strength and agility. To devotees of high-intensity workout programs like CrossFit — another of Yori’s passions — the show’s competitions are a natural extension of the barrier-busting workouts that have desk jockeys and dedicated athletes jumping, climbing, crawling, and balancing like caped superheroes. Challenge National Championship for flying disc. He also inspired author Jim Gorant to pen a best-selling book, “Wallace — the Underdog who Conquered a Sport, Saved a Marriage, and Championed Pit Bulls — one Flying Disc at a Time.” The champion dog eventually succumbed to an aggressive cancer, but his image and story still grace the logo of the foundation he inspired and the line of merchandise that raises money for the cause, including “pawtographed” copies of his best-selling book. Smarts and Heart The famous overachieving Wallace never fully overcame some of his pre-rescue quirks. “People assumed he did well with my dogs at home,” Yori remembers. “He didn’t. We had to rotate and manage at home. But he had a great life. I’d take him out on a long line and work with him and the Frisbee. When he was playing, he was focused. Working with him in the evening, in a big field where you can turn on the flood lights, those are some of my best memories.” The hard-to-place dog thrived in his adoptive home because his training and competition provided structure, outlet, and Wallace-centered quality time. Training for Success The Yori dogs have since included a one-eyed Pittie, a three-legged Corgi, and an ever-growing cast of canines with sad histories and sweet dispositions. Nobody in the pack is training for competition like their predecessor Wallace, but Yori continues to find time to nurture each dog’s interests and abilities. “red wheaten.” The nose is either black or brown and the eye color reflects the color of the nose. Ridgebacks have strong, smooth tails with a gentle curve towards the end. Rhodies are intelligent and intense, but also sensitive. Natural hunters and athletes, Rhodies have been known as lion dogs because they were fierce enough to corner a lion and keep him at bay while the hunter approached. At home, however, these performance athletes have a famously affectionate nature, known to be couch hogs who often cuddle with other pets or lean into their human companions. As snuggly and attached as they become with their favorite humans, they can be generally aloof with strangers. Beware of leaving food out as Rhodies are world class counter surfers — no food is safe! Interesting Fact Ridged hunting dogs roamed the land long before colonizers set foot in southern Africa. They were the trusted companion and hunting dog of the African Khoikhoi (Hottentot) people. Later, colonizers brought other dogs that crossed with the Khoikhoi dogs and produced a new kind of ridged hunting dog that was highly prized by big game hunters. By 1922, as big game hunting began to fade, enthusiasts drew from the Dalmatian Standard to develop the breed standard for what is now the 41st most popular dog in the U.S. This is a generally healthy breed, but can be prone to elbow dysplasia, canine hip dysplasia, and hypothyroidism. Deafness and dermoid sinus are also occasionally seen in the breed. Best Match Rhodies tend to be clean and quiet around the house, lounging while the world revolves around them. This pup needs physical and mental enrichment and is a good match for people who enjoy getting at least an hour of daily exercise. Pet parents can offer running, hiking and other activities like obedience, tracking and agility classes to meet these needs. This breed usually gets along well with household dogs and cats but will likely chase cats outdoors. The best matches are usually experienced dog handlers, especially active single people and families with older children, as Rhodies may accidentally knock over little ones. Either way, once you’ve befriended a Rhodie, you've got a faithful friend for life. Featured Adoptable Atlas Atlas is a 2.5 year old, 75 lb. Rhodesian Ridgeback and Lab Mix. “Are you looking for a little direction in your life? I am a wealth of knowledge and insight on all things pertaining to love, loyalty and friendship. I can protect you and our home like nobody’s business and I’ll provide you with the coordinates to all the doggy kisses and youthful energy you could ever ask for. When it comes to playing with other dogs and sturdy children 12+, you could say I’m on a course bearing straight for fun, fun, fun! (Cats, on the other hand, really throw the whole thing off axis!) If love is what you’re looking for, head straight for me. Just remember: even though I’m 2 ½ years old, already housebroken and crate trained, there is still a lot of puppy in me, and I will need your guidance on plenty of things. So, have you reached your destination?” Visit FamilyDogsNewLife.org. adventures just outside your back door — or at least a short drive from your neighborhood. Starting this month, even if you need a raincoat or boots, you can head out to see the wildflowers and waterfalls, and you’ll likely still find snowy places for exploring and snowshoeing too. Spot has compiled the best suggestions from experts and locals alike. Central Oregon For adventures on the east side of the mountains, there’s a handy local resource called DogPac.org. 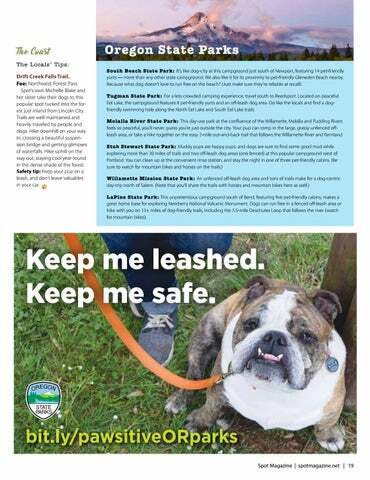 This non-profit advocates for off-leash recreation opportunities around the region and their website offers listings of dogfriendly hikes along with need-to-know tips on trail etiquette and safety. If you’re staying longer to explore the region, rely on Bennington Properties at Sunriver for dog-loving vacation rentals, social hours and expert advice on outings and adventures. They are a vacation-home company with a unique love of four-legged guests! Enjoy pubs, shopping, and more trails nearby. The Locals’ Tips: Good Dog! Trail. Fee: free The name says it all, doesn’t it? This dog mecca southwest of Bend offers year-round off-leash hikes of varying length and difficulty, plus river access, sun-drenched trails, and tree-lined walks that stay cooler in summer. DogPac.org provides poop bags and waste removal here, and you can support their work with a donation. Safety tip: After a day of exploring here, check dogs’ fur, paws, and ears for the clingy, trouble-making foxtail seed pods of cheatgrass. The Badlands. Fee: free Local Susan Gray says this vast expanse just east of Bend has great visibility and soft footing for dogs to run off-leash. Trails have varying length and difficulty with lovely desert flowers in the late spring. Safety tip: Watch for hot sand in the summer which can be too much for dogs’ paws. Local jackrabbits, visiting hikers and horseback riders will appreciate your dog being on leash or having rock-solid voice recall. Lookout Mountain. Fee: free If you’re looking for a cardio workout with your adventure, Susan Gray adds that just east of Prineville, you’ll find an invigorating uphill climb on this 9-mile trek to Lookout Mountain in the Ochocos. Here you’ll find Spring-blooming wildflowers in open meadows and you may encounter wild horses, elk, deer, and pileated woodpeckers. Safety tip: Water is scarce so be sure to carry enough for you and your dog. Sisters Mirror Lake. Fee: NW Forest Pass or Day Use Fee. If you and your canine are in relative shape, this rugged wilderness area offers lakes, ponds, and uphill treks. Sisters Mirror Lake is a local favorite 6.6 mile journey over moderate terrain with rewarding views. Safety tip: Mosquitos love it here too. Bring the bug spray and have your dog’s heartworm prevention up to date. Portland and Willamette Valley The Locals’ Tips: City Treks. Jeff Johnson of Tails & Trails shares that the Portland metropolitan area has many hidden trails. From cul-de-sacs to dead-end streets, these trails lead through Portland and surrounding communities. There’s a variety of excursions you can undertake during all seasons, giving yourself and your dog a variety of vegetation and landscape to enjoy and explore. Spencer Butte. Fee: free This trail, part of the Ridgeline Trail System around Eugene, “feels like an accomplishment when you reach the top,” says Spot’s own Megan Noes. Bring your fit Fido on a leash for a 1.7 mile workout with a rewarding view atop Mt. Pisgah overlooking the river and surrounding region. Safety tip: Make sure your pup is up to date on tick control. Also beware of rattlers and poison oak in season, and don’t leave valuables in your car at the parking area. Row River Trail. Fee: free (consider a donation to the Rails-to-Trails Conservancy) There are multiple entry points to explore varying lengths and scenery in and around Cottage Grove. Part of the Covered Bridges Scenic Bikeway and a Rails to Trails Conservancy project, here you’ll experience charm and history along the way. Safety tip: Aim for a cooler day to protect those paws on the portions that are asphalt pavement and bring water for Spot. The Locals’ Tips: Drift Creek Falls Trail. Fee: Northwest Forest Pass Spot’s own Michelle Blake and her sister take their dogs to this popular spot tucked into the forest just inland from Lincoln City. Trails are well maintained and heavily traveled by people and dogs. Hike downhill on your way in, crossing a beautiful suspension bridge and getting glimpses of waterfalls. Hike uphill on the way out, staying cool year-round in the dense shade of the forest. Safety tip: Keep your pup on a leash, and don’t leave valuables in your car. South Beach State Park: It’s like dog-city at this campground just south of Newport, featuring 14 pet-friendly yurts — more than any other state campground. We also like it for its proximity to pet-friendly Gleneden Beach nearby. Because what dog doesn’t love to run free on the beach? (Just make sure they’re reliable at recall). Tugman State Park: For a less crowded camping experience, travel south to Reedsport. Located on peaceful Eel Lake, the campground features 8 pet-friendly yurts and an off-leash dog area. Do like the locals and find a dogfriendly swimming hole along the North Eel Lake and South Eel Lake trails. Molalla River State Park: This day-use park at the confluence of the Willamette, Molalla and Pudding Rivers feels so peaceful, you’ll never guess you’re just outside the city. Your pup can romp in the large, grassy unfenced offleash area, or take a hike together on the easy 2-mile out-and-back trail that follows the Willamette River and farmland. Stub Stewart State Park: Muddy pups are happy pups, and dogs are sure to find some good mud while exploring more than 30 miles of trails and two off-leash dog areas (one fenced) at this popular campground west of Portland. You can clean up at the convenient rinse station, and stay the night in one of three pet-friendly cabins. (Be sure to watch for mountain bikes and horses on the trails.) Willamette Mission State Park: An unfenced off-leash dog area and tons of trails make for a dog-centric day-trip north of Salem. (Note that you’ll share the trails with horses and mountain bikes here as well.) LaPine State Park: This unpretentious campground south of Bend, featuring five pet-friendly cabins, makes a great home base for exploring Newberry National Volcanic Monument. Dogs can run free in a fenced off-leash area or hike with you on 13+ miles of dog-friendly trails, including the 3.5-mile Deschutes Loop that follows the river (watch for mountain bikes). Keep me leashed. Keep me safe. Making a Fat Cat Fit If you’re looking to increase your family’s activity level, the most challenging household member might be the one who sleeps 12-16 hours out of every 24. No, not your teenager. Your cat! Obesity is as prevalent in cats as dogs and humans, and fat cats increase their risk of life-changing conditions like diabetes, arthritis, and injuries. If your cat is looking too well-rounded, check with your doctor for any underlying conditions and ask for advice on dietary changes. Your next step is to increase your cat’s activity. That’s fairly easy for a frisky feline who loves to chase a feather toy or laser pointer. Simply schedule time every day to get that kid sprinting and pouncing (while you’re careful to never point the laser directly in her eyes.) But if your feline flops around the house like a snuggly meatloaf, you can use his natural instincts to get him moving more. Cats love to hunt for dinner, so divide his meal into several small morsels and place them as far apart as possible: upstairs, downstairs, kitchen, laundry room, high perches and low spots. And speaking of high and low spots: cat trees, kitty condos, catios, and clever cat-shelf systems inspire even the laziest lap-warmer to move more, even if only to snag a prime napping perch. Spirits Tasting Room. A benefit for Mt. Bachelor Avalanche Rescue Dogs that combines your favorites: yoga, cocktails, and a good cause. $20; bring your yoga mat. VisitBend.com. Room, 237 NE Broadway. Benefit for Animal Aid PDX includes trivia, board games, snack foods, beverages and pawesome auction items. $30/advance, $40/door. Details & tickets AnimalAidPDX.org/Pup2019. Adoption Team. Learn how to give your time, skills, and talents to help cats and kittens at CAT. No registration required. CatAdoptionTeam.org. Public Works. Gathering to raise awareness about the dog foster program. Family-friendly booths, photo booth, free drawings for gift baskets, free snacks for people & dogs. co.Marion.or.us/CS/DogService. Humane Society Education Room. Learn to properly care for and feed bottle baby kittens before kitten season starts. Open to public, fosters, and volunteers. Free. Registration required at foster@ green-hill.org or Green-Hill.org. Crooked River Brewing. Familyfriendly fun every Thursday to raise money for the community’s animals, and a little for yourself if you’re lucky. $1/round. HSONoKillShelter.org. Rd. “Flora’s Workshop” is a twoday camp to teach behavioral, basic handling, crate games, and other skills for a happy, engaged, focused dog. A benefit for Herd U Needed a Home canine rescue. $100/day. Registration & info at camphunah@gmail.com. Complex. Hosted by Feline Friends of Olympia and Fences For Fido. Egg hunts for dogs and kids, dog fashion show, vendor and nonprofit booths, snack & bake sale, raffles, more. $4/adult, $1 kids under 12, $4 fashion show entry, cash/check only. by Rabbit Advocates. Free nail trims & light grooming for your pet rabbits. Free tips and experts on hand, plus meet adoptable rabbits. Free/ suggested donation $5 per service. RabbitAdvocates.org. We have all seen this sign and we all know that sinking feeling when we realize that our dog, “our family” is not welcome. With over 115 Dog Loving Vacation Rentals to choose from, you and your family will experience the joy of being accepted and welcomed just as you are, fur and all. At Bennington Properties, we don’t just allow your dog, we LOVE your dog. NW 3rd St. Meet adoptable cats at the bank every 3rd Friday of the month. If you meet the cat of your dreams, complete an adoption application to put the cat on hold. HeartlandHumane.org. 20 10-2 • PORTLAND — ANNUAL PLANT AND VEGAN BAKE SALE FOR HOUSE OF DREAMS at 7634 SE Morrison. Indoor and outdoor plants for sale, decorative pots, garden art, cat toys & merchandise to benefit the cat rescue. Details KittyDreams.org. Broken Top Bottle Shop, 1740 NW Pence Ln. Pints, friends and a good cause: support Fences For Fido in building fenced yards to free dogs from life on a chain. Details: FencesForFido Facebook events. at Cat Adoption Team. Learn how to give your time, skills, and talents to help cats and kittens at CAT. No registration required. CatAdoptionTeam.org. NW Evergreen Pkwy. Details GPA-NW.org. at Esther Short Park. Help Humane Society for SW Washington care for animals in need. 3-mile dog-friendly walk or 5K chiptimed dog-friendly run. $40-45, kids free. Register in advance at SouthwestHumane.org/walk-run. Washington on the OSU Campus. Come to the Greyhound Pet Adoption NW booth and meet adoptable dogs. Event is free but some activities have nominal fees. GPA-NW.org. Art Museum, 1219 SW Park Ave. Come to Funkytown for Caturday Night Fever. A benefit for Feral Cat Coalition of Oregon, including dinner and silent and live auction, disco dancing. 70s outfits encouraged. Tickets & info at FeralCats.com/Furball-Info. Rd. “Flora’s Workshop” is a twoday camp to teach behavioral, basic handling, crate games, and other skills for a happy, engaged, focused dog. A benefit for Herd U Needed a Home canine rescue. $100/day. Registration & info at camphunah@gmail.com . McCall Waterfront Park to benefit Oregon Humane Society. Portland’s best and biggest pet event, a walk/run and food and activities on the waterfront. Enjoy 10% off registration with code SPOT2019 OregonHumane.org/ doggiedash. 10-3 • SUNRIVER — DOG DAY IN MAY at the Village at Sunriver. A benefit for Ronald McDonald House Charities of Oregon & SW Washington, the day includes a 5K Poker Dog Walk/Run at 10, festivities in the Village begin at 11 with vendors and dog talent contest. Free. Details at VillageAtSunriver.com. own yoga mat for a yoga class with adoptable cats roaming the cattery and plenty of time to visit cats after class. $20, register at EugeneYoga/us. 12-3 • TIGARD — BUNNY SPA DAY & ASK THE RABBIT EXPERTS at Tigard PetSmart. Offered by Rabbit Advocates. Free nail trims & light grooming for your pet rabbits. Free tips and experts on hand, plus meet adoptable rabbits. Free/suggested donation $5 per service. RabbitAdvocates.org. Island Rd. A benefit for Greenhill Humane Society and First Avenue Shelter, join over 1,000 people & dogs for a 2K/5K/10K run/walk with activities, vendor booth, agility demonstrations, more. Registration and details at Green-Hill.org/bark. 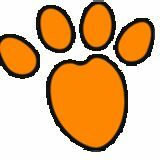 HALSEY EAST ANIMAL CLINIC Because we care for you and your dog, we now offer training and classes. A full-service Veterinary Clinic plus: • Puppy Kindergarten • Obedience classes • Enrichment Training • Private Lessons • Daycare and Boarding A well-mannered dog is a joy to live with, let us help you get there. We’re proud to be your preferred Hillsboro veterinarian. Frontier Veterinary Hospital has been locally owned & family operated since 1947. We are a full-service small animal hospital serving pets & the people who love them! Our practice is designated as a Gold Level Cat Friendly Practice by the American Association of Feline Practitioners (AAFP). We love cats and have also achieved their highest level designation. We provide comprehensive care for your dog, from puppyhood to the golden years. And your dog’s visits will always include lots of treats and love – we want to be a place your dog enjoys visiting! As a Cat Friendly Practice, we know that cats need healthcare, too! We are passionate about feline health and committed to making your cat’s visit a positive experience. Dr. Claire Peterson handles all your avian medical needs, from finches and budgies to macaws and African grays...she treats your backyard chickens and ducks, too! We provide basic care for rabbits and other small mammals like guinea pigs, hamsters, and gerbils. We also provide boarding for these little friends! Laurel Werhane creates beautiful Cremation Ash Keepsakes to commemorate the memories of your beloved pet from her studio in Redmond, OR. 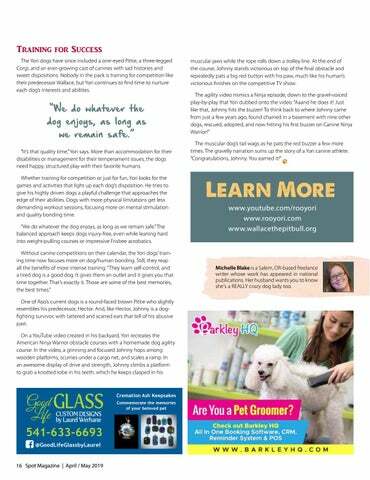 Featured in the Redmond Spokesman and now showing at the Lotus Moon Boutique, Laurel's GoodLife Glass works with her customers to help create the perfect memorial piece that best captures the essence of their pet. Looking to explore Oregon with the furkids? Here are a few Oregon State Parks worth a visit! 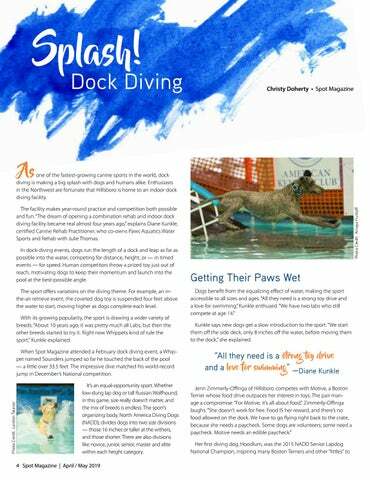 Learn more about the smile-inducing, tail-waggin' sport of dock diving.